Keeping learners accountable through the assessment of learner interaction and collaboration allows learners to be assessed informally, as well as formally, in the virtual classroom. And as Jennifer Hofmann states in her blog, The Art of Design for the Virtual Classroom, "The modern virtual classroom calls for modern design which stimulates engagement, exploits multiple instructional tools, and creates an authentic learning environment." In this blog we break down the key ingredients to assess your learners informally and formally using five dos and don’ts, while keeping the authentic learning environment prevalent within the confines of the virtual classroom. Generally we are talking about two types of assessment – qualitative and quantitative. Let’s first be clear that you can know whether or not people are still with you by paying attention to their responses. How many questions someone asks, or doesn't ask, can be an assessment, as well as the quality of questions someone asks. In terms of quantity: We are looking at how much or how often we are hearing from the learners. Are people raising their hands? Are they using the emoticons? Are they using the tools to interact with you? In terms of quality: We are looking at how deep those conversations are going. “Yes, I agree.” is rarely the response of someone who is totally engaged. “Can you repeat the question?” could be from someone who may be multi-tasking. “I agree with that because ……” is a response of someone making connections. “I can relate to that in ….” likely comes from someone transferring the knowledge into real work. People may ask you to repeat the question or activity instructions, which is fine. It's better to repeat them, than to have people disengaged from the class and doing their own thing. So really, what we are looking for is appropriate comments from our participants that show us through an informal assessment that they are engaged and learning. 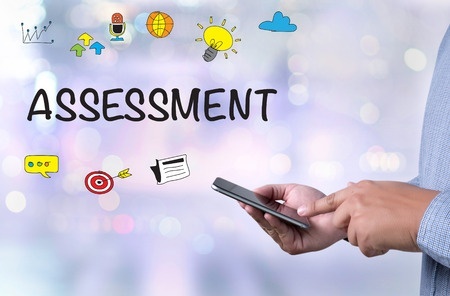 Both quality and quantity as types of assessments can be used in the virtual classroom, and both can be supported by the virtual classroom, both informally and formally. However, what we see often in the virtual classroom is no assessment or accountability is used. Why? Typically, it's because we don’t know how to assess or hold our learners accountable in this virtual learning environment. To make it easier, use these examples of informal and formal virtual classroom learner assessment. Informal assessments are those assessments that result from facilitator observation of how students behave and perform in class. Instruct the use of green check/red X as a way to assess if students are agreeing or disagreeing with the content. Instruct the use of emoticons to assess learner’s emotion in the virtual classroom. Encourage the use of the raise hand icon to access the learner’s content knowledge – questions/comments. Utilize the art of hard and soft calling to access the opportunity for discussion. Hard calling is the act of calling on someone without warning. Soft calling, on the other hand, is the act of calling on someone after you have given them time to think and asked them to use a feedback tool to indicate when they are ready. A soft call is using the feedback tool to open the discussion. Formal assessments are preplanned, systematic attempts by the facilitator to ascertain what students have learned. They are typically built into the design of the class. You can use virtual classroom tools to formally assess learners in this environment. Some examples of tools to use to assess formally in the virtual classroom would be to build documentation activities into the content and encouraging students to showcase. By following these five dos and don’ts you will be able to create authentic learning while ensuring the success of your learners through informal and formal assessments. Don’t confuse collaboration and assessment. Having access to and using the tools like chat rooms, whiteboards and application sharing does not guarantee a collaborative interaction. The only way to guarantee that you have an activity set up for success is to assess the collaborative experiences through the use of chat, whiteboard, and showcase. Learners must experience the collaboration and then bring that back to the main room for assessment. Ask learners to document their findings on the whiteboard after a private chat activity. Ask the team to showcase their learning but demonstrating the task after a breakout. Use application share to assess the knowledge of the learners after a lesson on a piece of software. Do allow learners to assist one another in the learning process. After completing independent work in offline groups, encourage documentation or application opportunities for learners to work in teams to solve problems, answer questions, and pose solutions to authentic case studies. You can assess learners through showcase, action plans, and shout outs. Do recognize and reward learners. Thank them verbally for being the first one to respond. Tie back to a prior time a learner shared an answer. Connect offline assignments to in-class content using quotes from assignments. Encouraging learners to take accountability for their own learning ensures virtual classroom success. Learners must feel good about the risks they are taking during the assessment process in order for them to make successful changes in their day-to-day work. Without creating and maintaining a culture of accountability, learning transfer and application is simply left to webinar-style talking head event events. In real virtual learning events, interaction, collaboration and assessment drive knowledge transfer and application.